Anything with angels in it has to be part of Christmas and this Christmas Carol is no exception. 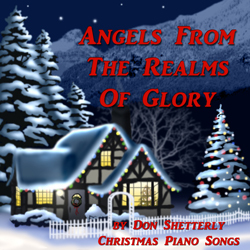 A majestic song, Angels From The Realms Of Glory, speaking about the Christmas story. Come and worship, come and worship, Christ, the newborn king signifies the essence of this song. It has a lively upbeat tempo that is played with power and reverence. Track #2 of 15 songs on Christmas Piano. James Montgomery wrote this Christmas carol and first printed it in 1816. It was included in one of the first hymnbooks used by the Church of England and so it became prevalent in that day. James Montgomery was a well-known poet in his time who began writing poetry at the age of 10. Even though James Montgomery flunked out of school at age 14, he found a job at a local radical newspaper. Later, he would become the editor of the paper and change its name. Angels From The Realms of Glory was first published in his newspaper. While there are mainly four stanzas that are sung today, the original had a fifth stanza that was somewhat harsh. Usually omitted these days, the song had a logical progression where stanza one is about the angel’s song. Stanza two is the shepherd’s adoration, and stanza three is the sages’ gifts. The fourth stanza four is saints’ praise, and the fifth stanza which is generally omitted is about the sinners’ repentance. Personally, I can see why that fifth stanza has been dropped because it is a downer taking away from this magnificent and majestic song.